Handsome Euro-Cal bistro with a gorgeous ocean view. : Motif is an upscale resort-casual restaurant located in the St. Regis Resort, Monarch Beach. The modern décor is influenced by Mediterranean sensibilities and the restaurant presents a Euro-Californian breakfast and lunch and a more formal dinner. The menu is overseen by the resort's executive chef, Frederic Castan. 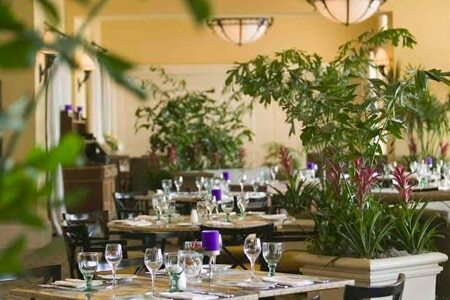 The food is rather good, but perhaps the most impressive part of the venue is the soaring views of the lush green Monarch Beach Golf Course and the blue Pacific from indoors and the terrace. Offerings are built on a base of classic and contemporary meat and seafood dishes with French, Italian and Californian motifs. The wine list is eclectic, so ask the sommelier to pick out the best red or white to go with your meal. Sunday brunch is one of OC's best (and pricier) options, with limitless premium Champagne and what seems like oceans of cheeses, charcuterie, salads, sushi, pancakes, carved meats and hot selections.